Eucerin Sun Fluid Mattifying SPF 50+ is an innovative facial sunscreen that is specifically formulated to protect against sun-induced skin damage and pigment spots. 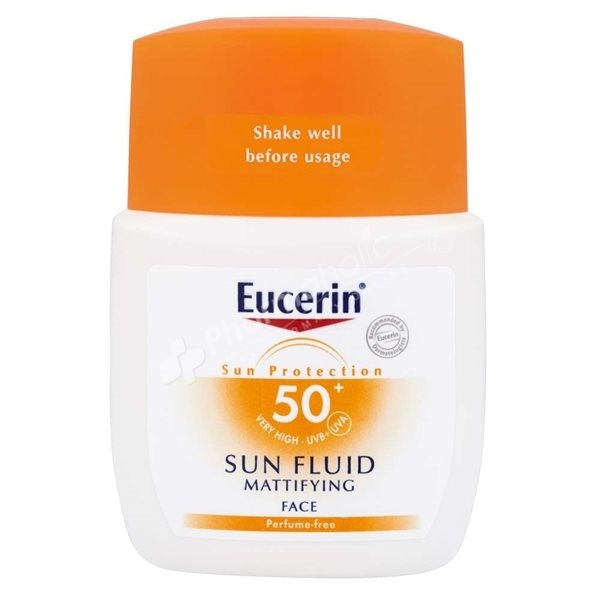 Eucerin Sun Fluid Mattifying SPF 50+ is an innovative facial sunscreen that is specifically formulated to protect against sun-induced skin damage and pigment spots. For normal to combination skin. Water-resistant. A highly effective, photostable, UVA/UVB filter system with Tinosorb S provides reliable protection against sunburn. EU- and Cosmetics Europe – The Personal Care Association (formerly called Colipa)-compliant. Glycyrrhetinic Acid protects DNA by supporting the skin´s own DNA protection and repair mechanisms. Cellular protection comes from Licochalcone A - a powerful antioxidant that protects the skin cells against damage caused by free radicals. The ultra-light, non-greasy texture mattifies the skin and does not leave an oily shine. It even works well in warm, humid climates. Avoid contact with the eyes. Do not use for small children. Avoid intensive midday sun and extensive sun exposure as even sunscreens with high SPFs do not offer a 100% protection. Avoid contact with textiles and hard surfaces to prevent staining. Do not stay too long in the sun, even while using a sunscreen product.